I am a registered independent who does vote in all of the Presidential election cycles and in all of the mid-term elections. I have voted for several Republicans and several Democrats throughout the years. I am not a fan of either of these two main parties and I darn sure can not stomach Hillary Clinton nor Donald Trump, I do believe that these two caricatures belong chained in the basement of a Federal Pen until the day they rot away and die. In case you are wondering, I voted for Gary Johnson back in 2016 for President, not because I thought that he would win anything, I just couldn’t get myself to vote for either of those other two donkeys behinds. Now, I am going to tell you what I believe is the honest truth about what happened on election night of 2016. What I believe as of tonight is exactly what I believed happened back on November 8th of 2016, no changes. As pretty much almost all sane folks know (if you are a person who believes all the security agencies) Russia at the direction of their President Mr. Putin had their security agencies interfere in 21 States computer election systems. It is a fact that all these Russian hackers had to do was to move about 1/2 of 1% of the votes in just 3 or 4 of the States that were projected to be close that Hillary was projected to win. This would be enough to flip the winner of the Presidential election away from Hillary whom Mr. Putin hates to Mr. Trump whom I believe Mr. Putin has major ‘dirt’ on. Hillary won the popular vote by a little over 2.8 million total votes. This is more than 5 times the amount that Al Gore beat George W. Bush by back in 2000 yet some how the ‘Arkansas Witch’ lost the election. If you are wondering, Mr. Gore beat Mr. Bush by a little more than 500,000 total votes. Mr. Trump likes to say that he won the election by a ‘historic’ amount even though history shows him to be a liar even on this matter, but then, what doesn’t this fraud not lie about, daily? Mr. Trump is said to have won 304 Electoral College votes to Hillary’s 227. For a person to win the election the had to garner at least 270 of these votes. So, Mr. Trump received 34 more than required to be the winner. Next I am going to show you a few final numbers from the 2016 election. There are more States with more examples of these issues, I have just picked 4 of them to show you. All of these States the poles right up to the election and the exit polls after people had voted all said that Hillary would win these States, but the computers say she didn’t. Folks remember, on these percentages all you have to do is to cut the wining margins in half to change the outcome of the election. For example lets use Wisconsin. Mr. Trump is said to have won by .81%, now, cut that in half, take away .41% and give it to Hillary. This would equal a Hillary win 47.86% to Trump at 47.85%. Example of Michigan, .12% changes the winner. It is a well know fact that Russian intelligence agencies hacked these States systems trying to help Mr. Trump win. All that historically huge win that Mr. Trump has bragged about would have changed if Hillary had won even the three smallest of these States, Pennsylvania, Michigan and Wisconsin. Folks, this is just 3 of the 21 the Russian Agencies hacked. These three States alone totaled 46 Electoral Votes. Flipping just those three States, those 46 votes would have made the final Electoral Vote tally of Hillary 273, Trump 258. I honestly believe that we have a ‘fake’ President who is going to end up being impeached. I would say imprisoned also except that I am quite sure that President Pence as his first piece of business will pardon Mr. Trump of all of his felonies, including the treason charges I believe Mr. Mueller will prove Trump guilty of. I believe that Mr. Trump will pardon all of his mafia clan before he is himself impeached. The clan of which I speak does include the two crooks convicted today, Mr. Cohen and Mr. Manafort. I also believe that Mr. Mueller will get convictions on Eric and Donald Trump Jr, Ivanka Trump and her husband Jarred Kushner. On the sidelines of the Group of 20 summit in Germany last month, President Trump’s advisers discussed how to respond to a new revelation that Trump’s oldest son had met with a Russian lawyer during the 2016 campaign — a disclosure the advisers knew carried political and potentially legal peril.The strategy, the advisers agreed, should be for Donald Trump Jr. to release a statement to get ahead of the story. They wanted to be truthful, so their account couldn’t be repudiated later if the full details emerged. As special counsel Robert S. Mueller III looks into potential obstruction of justice as part of his broader investigation of Russian interference in the 2016 election, these advisers worry that the president’s direct involvement leaves him needlessly vulnerable to allegations of a cover up. Director of National Intelligence Daniel Coats told associates that Trump asked him in March if he could intervene with Comey to get the bureau to back off its focus on Flynn. In addition, Trump has repeatedly criticized Attorney General Jeff Sessions for rescuing himself from overseeing the FBI’s Russian investigation — a decision that was one factor leading to the appointment of Mueller. And he has privately discussed his power to issue pardons, including for himself, and explored potential avenues for undercutting Mueller’s work. The director of the independent Office of Government Ethics, who has been the federal government’s most persistent critic of the Trump administration’s approach to ethics, announced Thursday that he is resigning nearly six months before his term is scheduled to end.Walter M. Shaub Jr. repeatedly challenged the Trump administration, publicly urging President Trump to fully divest from his business empire and chastising a senior Trump adviser for violating ethics rules. His outspokenness drew the ire of administration officials and earned him near-cult status among Trump’s opponents. Fans started a Facebook page in his honor, and his name has occasionally appeared on posters at anti-Trump protests. In an interview, Shaub said he was not leaving under pressure, adding that no one in the White House or the administration pushed him to leave. But the ethics chief said he felt that he had reached the limit of what he could achieve in this administration, within the current ethics framework. Created in 1978, the ethics office is designed to promote and protect laws intended to prevent conflicts of interest by government officials. The office offers ethics guidance and training for government officials and oversees employees’ annual disclosure of personal finances, but it has limited enforcement authority. Directors are appointed by the president and confirmed by the Senate to five-year terms — a length of time intended to give the office independence by ensuring director’s terms overlap presidential administrations. Shaub’s departure is likely to spur a sense of anxiety among ethics officials and critics of the president who viewed him as one of the few federal officials who had been willing to speak out when he viewed the administration departing from past ethics norms. Trump allies cast him as a grandstander and noted he had been appointed by President Barack Obama. Shaub, who before his appointment had served in other roles at OGE and as a lawyer at other federal agencies dating to 1997, was named OGE’s director by Obama in 2013 and had been scheduled to serve until January. Shaub’s willingness to challenge the Trump administration was apparent even before Inauguration Day. The first sign that he would be outspoken with his concerns came on the morning of Nov. 30, when the official OGE Twitter account erupted in a storm of nine tweets sent over three minutes that appeared to mimic Trump’s bombastic tweeting style, urging the president-elect to separate himself from his business. “[email protected] OGE is delighted that you’ve decided to divest your businesses. Right decision!” read one tweet. “[email protected] OGE applauds the ‘total’ divestiture decision. Bravo!” read another. Trump had in fact made no such decision. The tweets appeared designed to use Trump’s own tactics of praise and flattery to urge him do so. Internal OGE emails later released through public information requests showed that Shaub himself had drafted the notes and directed that they be sent. When Trump announced on Jan. 11 that he would retain ownership of his business, merely transferring management to his adult sons Eric Trump and Donald Trump Jr., Shaub aired his concerns in an unusually public address at the Brookings Institution. He denounced the plan as “wholly inadequate” and insisted Trump should place his assets in a fully blind trust over which his family would have no control, to prevent him from making money from decisions he enacted as president. In March, Shaub chided the White House over its failure to discipline senior aide Kellyanne Conway after she urged viewers on Fox News to “go buy Ivanka’s stuff,” a reference to the apparel line owned by the president’s daughter. Federal law prohibits government employees from endorsing brands or products. More recently, Shaub has clashed with the White House over his efforts to gather data about former lobbyists and other federal appointees who had been granted waivers to ethics rules allowing them to interact with their former employers while serving in the White House or at federal agencies. The Office of Management and Budget had tried to block Shaub’s request for copies of the waivers, prompting him to pen a scathing 10-page letter refusing to back down, writing that the OGE expected federal agencies to comply with the request. “Public confidence in the integrity of government decision making demands no less,” Shaub wrote. Ultimately, the White House released the documents as Shaub had demanded. They showed 17 appointees had been granted waivers to ethics rules to allow them to serve in the White House, including four lobbyists. But Shaub has continued to agitate over the issue, particularly an undated and unsigned waiver allowing all White House officials to interact with the news media. The ruling means that chief strategist Stephen K. Bannon can communicate with editors at Breitbart, the conservative publication he used to run. “There’s no such thing as a retroactive waiver,” Shaub said last month, promising to keep pressing the White House on the issue. Shaub said Thursday said that his new post at the Campaign Legal Center would provide a platform to work on improving ethics rules in a nonpartisan environment, adding that he did not want to lose the opportunity by waiting until the end of his term. Matea Gold is a national political reporter for The Washington Post, covering money and influence. NEW YORK — Jared Kushner had barely survived a fight to save his family’s real estate empire.Taking charge of the business after his father went to prison, Kushner, 25 at the time, paid $1.8 billion in 2007 for the nation’s most expensive office building. Then the market went south, the debts piled up, and Kushner spent years pushing banks to renegotiate the loans. “Was it the right thing to do? At the end of the day, it was a function of saying, ‘You’re trying to make my life miserable. Well, I’m doing the same,’ ” Kushner said. “To Jared, it was such a benign thing, and to myself, it was just one of the most deeply offensive . . . things that had ever happened to me professionally,” Kamer said. Ivanka Trump and First Lady Melania Trump visit the Western Wall. (CNN) President Donald Trump made history on Monday when he became the first sitting president to visit Jerusalem’s Western Wall, one of the holiest sites in Judaism. But the trip was also “deeply meaningful” for daughter Ivanka, who appeared to cry as she visited the wall. The Western Wall sits in Jerusalem’s Old City, which was captured by Israel during the Six-Day War in 1967. There are separate areas for men and women’s prayer. Accompanied by first lady Melania Trump and the Rabbi of the Western Wall’s wife, Yael Rabinovich, Ivanka Trump solemnly placed her hand on the women’s area of the Western Wall for a full minute. She smiled as she walked back toward the women and appeared to wipe away a tear, looking visibly touched by the experience. “I am grateful to have experienced a deeply meaningful visit to the holiest site of my faith and to leave a private note of prayer,” she posted on social media shortly after the visit. The President’s eldest daughter converted to Judaism ahead of her 2009 wedding to Jared Kushner, and previously visited Jerusalem in 2010. She and her husband are practicing Modern Orthodox Jews. Today was amazing. I visited the Hotel this am and then took a very long walk around Jerusalem. I’m so sad to be leaving Israel tomorrow! She has spoken about her faith very rarely. “During this time, we disconnect completely — no emails, no TV, no phone calls, no Internet. We enjoy uninterrupted time together and it’s wonderful. In addition to being a sacred part of our religion, we live in such a fast-paced world that it’s enormously important to unplug and devote that time to each other,” she said. Trump traveled to Saudi Arabia with her father, stepmother, and key advisers. She will also travel with the group to Rome, Italy, later this week. 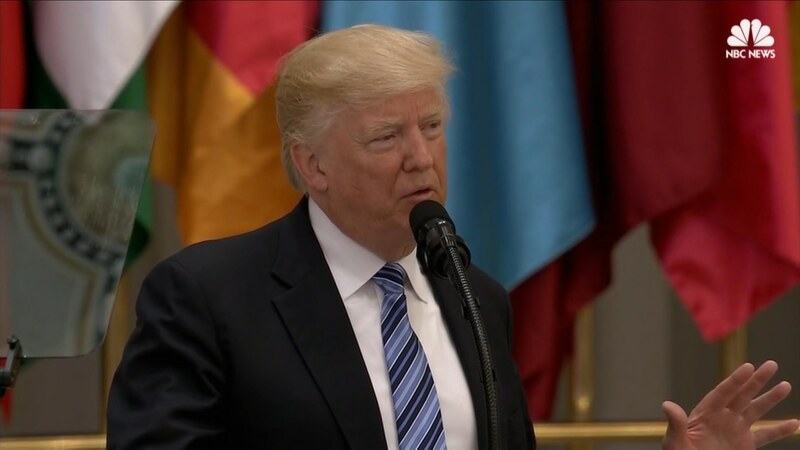 RIYADH, Saudi Arabia — President Donald Trump’s remarkable visit to Saudi Arabia ended as it began: with warm applause from Saudi leaders who displayed real pride in the fact that an American president chose the religious center of the Muslim world as the first stop on his first trip abroad. There is something remarkable too about the leader of the Western world speaking in the city where Osama bin Laden was born. A New Yorker, Trump, addressing Muslims in the country where 11 of the 19 terrorists of the September 11th attacks were born. 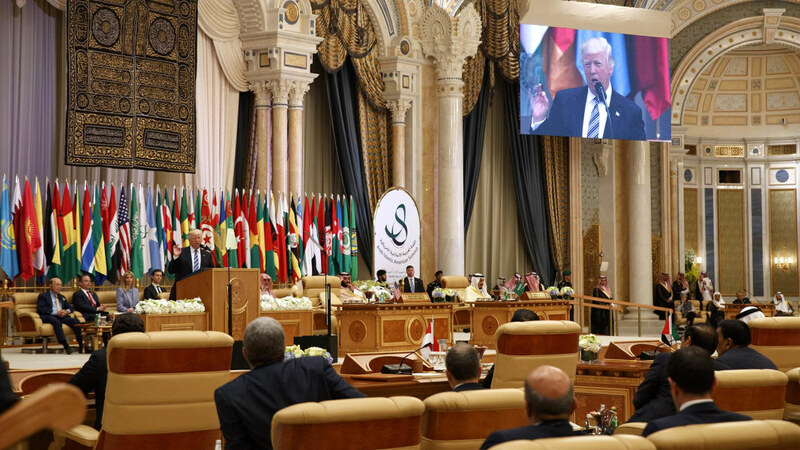 This, he said, is a battle between good and evil and urged Muslim countries had to “fulfill their part of the burden” — not just wait for American intervention. But there was none of the inflammatory language typical of domestic Trump. He did not use the phrase “radical Islamic terrorism,” which he has specifically used several times before and which is considered offensive by many. In fact, he said he was “not here to lecture” the Muslim leaders, or to impose an American way of life. At the final major event of his visit — a conference on social media and countering terrorism — the president’s schedule got squeezed and he had to leave the speaking to his daughter Ivanka. Still, there is a definite security threat here and it’s clear it’s being taken seriously: Every major road in Riyadh is lined with troops and police. But surrounded by huge photographs of himself in a city dripping in gold, while making deals worth hundreds of billions of dollars — Trump may have felt he was in a special but familiar place. Everywhere you look in Central Riyadh there are giant images of Trump and the Saudi King side by side. 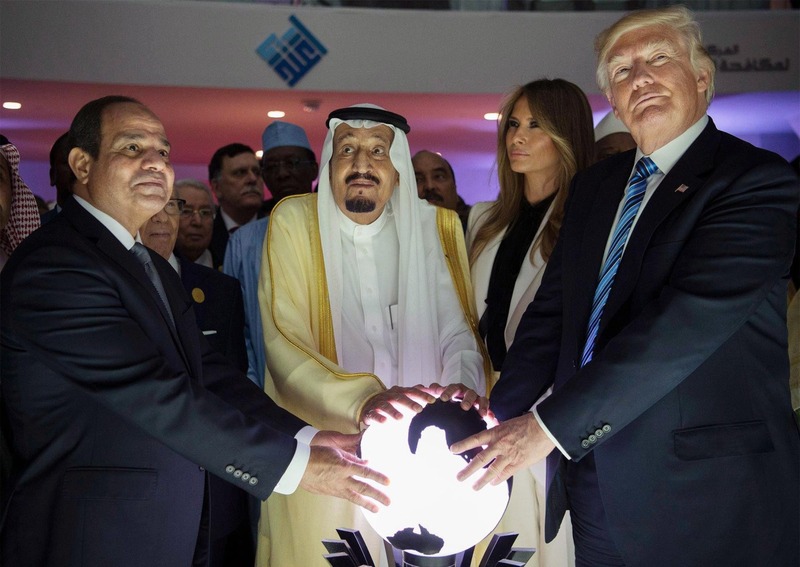 “Together,” they proclaim, “we will prevail,” a slogan that boats of a renewed military and economic bond between the U.S. and Saudi Arabia. An alliance against rivals in Iran and threats from ISIS. Here, all is apparently forgiven. They have forgotten Candidate Trump, who railed against Muslims on the campaign trail, and even Early President Trump, who tried to push through a ban on Muslims entering America. Now they have Best Friend Trump, who sees in the Saudis an opportunity to make money and buy peace in the region. There are similarities between the leaders of Saudi Arabia and the United States. The rulers of the Desert Kingdom are a family, the al-Sauds — King Salman and his many Princes. They do business in the billions of dollars but often in a personal, traditionally Arab way. That’s been Trump’s way too, and he’s done business here in the desert through his family. The arms deal the two countries have signed, worth at least 100 billion dollars, was done with the help of Trump’s son-in-law Jared Kushner. 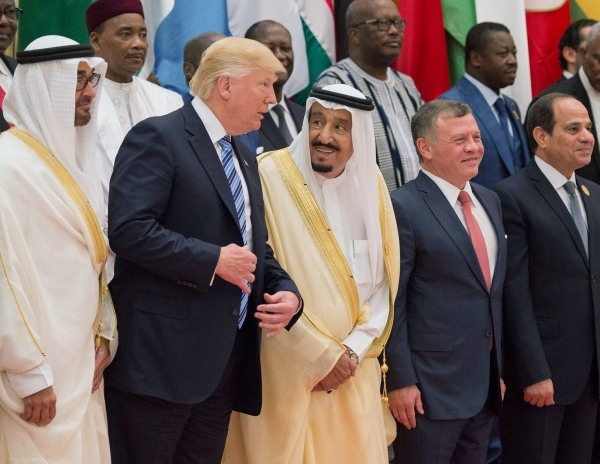 He amazed a visiting Saudi delegation at the White House earlier this year by picking up the phone to the boss of Lockheed Martin and haggling over the price of weapons the Saudis found too expensive. There’s even quiet talk here of his next stop, Israel, as well as the common enemy shared by Saudis, Gulf Arabs and Israelis: Iran. Washington (CNN) President Donald Trump privately signed a bill on Thursday that allows states to withhold federal money from organizations that provide abortion services, including Planned Parenthood, a group frequently targeted by Republicans. Ivanka Trump, what do you do? The law once again raises questions about the power Ivanka Trump, the President’s daughter and aide, actually wields inside the West Wing. The first daughter met with president of Planned Parenthood shortly after her father was inaugurated in an attempt to better understand the group that is regularly targeted by Republicans. She has also cultivated an image of a moderating force inside the White House. The President has even said Ivanka Trump would be his guide on women’s health issues. What is being done to save Obamacare? But the first daughter has been hesitant about publicly speaking about her views on abortion, despite saying she would be an advocate for women’s health inside the White House. What is clear is that the meeting with Planned Parenthood — and whatever information Trump took away from it — did not sway her father’s administration, which has since targeted the organization. The Republican health care bill, which was fully backed by the White House, would have defunded Planned Parenthood. 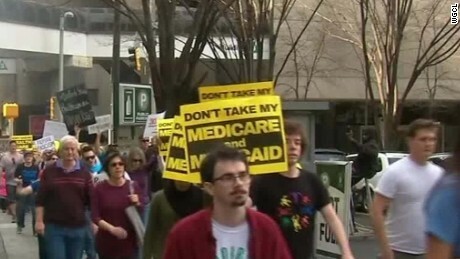 Democratic organizations blasted the bill on Thursday.